There is a lot going on this time of year so we will take a look at all of the major fisheries, sockeye, chinook, and coho. Sockeye: The fishing has not been what I would call easy, by sockeye standards. We have had some amazing catches, but until recently it has been confined to a fairly narrow window of opportunity from first light until about 9:30 or 10:30 am and then they go off the bite and you have to grind for them. If you are able to get on a good school first thing in the morning though, look out, as it has been hot and heavy. If you aren’t on a school right away and you don’t find one by mid morning, you are likely going to have a lot tougher day. We are still catching fish mid day and in the afternoon, but you just have to grind away at them to get the numbers. As the numbers of sockeye build, this will change, and it is already happening. Our boats had some solid action on their afternoon trips just yesterday, so from here forward that trend should continue. There will always be the first morning bite, but as numbers build this coming week there will be enough fish around that even during mid-day the action will be enough to keep you busy. Captain Lars netted this triple header on yesterdays afternoon charter off the North Arm. Let’s look at some numbers. If you haven’t had red hot fishing, don’t worry as things are actually just getting going and we are far from seeing the best sockeye fishing of the season. The estimate as of August 20th is that 2,783,700 fish have made it into the river. The run is still currently tracking at its p50 forecast of 13,800,00 fish, so only 20% of the run has shown up so far. So think about that, we know that in the next 4 weeks about 11,000,000 more fish are going to show up. When that happens you are going to see some pretty easy fishing. Things should get really consistent this coming week and all of the week after that. Lets talk about gear and locations. The blue flashers have been working very well for us. This seems to be especially true when we have been fishing on the schools further offshore in 500-700 feet of water and the water is cleaner. We have experimented with greens and chartreuse in these conditions, but the blue has consistently out performed. When we have been fishing in tighter in 100-200 feet and in dirtier water, we have found the green or chartreuse flashers and blue flashers have been about 50/50. We have been using Michael Baits with a glow head and a 24-32 inch leader and trolling just fast enough for the flasher to rotate. This seems to be working well for us, check out some of the pictures on our Facebook page and Instagram account. Happy guests holding up just a few of the sockeye from a successful 2 boat trip with Captain Lars and Captain Khoi on Thursday morning. We haven’t been fishing down at the South Arm as most of our sockeye trips have been half-day trips. We have had good success around the QA and North Arm down to the Iona Jetty. There have been schools in as tight as 150 feet of water and as far out as 700 feet of water. In terms of depths, the fish have been as shallow as 50 feet and as deep as 110 feet. Most of the fish I saw on my sonar this past week were around 80-100 feet down. I have seen some decent sockeye fishing down at the South Arm when I have been down there chinook fishing, but I can’t speak to it directly as I haven’t soaked the sockeye gear down there. So in conclusion, get ready, they are coming…. Chinook: On our longer trips we have been sockeye fishing for the first few hours of the trip, getting some in the box, then heading down to the South Arm for chinook. In short the fishing has been good. The usual tactic of fishing anchovies or herring in teaser heads on all 4 rods has been productive. We have been using the classic flashers for this fishery, like the BC, STS, Madi, and some new favorites like the Gibbs Phantom in Chartreuse. That last one seems to be pretty hot for me lately. Use a 6 foot leader to a Rhys Davis anchovy teaser head in UV Green or Glow Green/Chartruese and you are off to the races. We are starting to see some of the larger white springs show up as well and there will be more on the way as we get closer to September. Normally there would be lots of boats fishing off the Bell this time of year, but the last few times I went by there on a flood tide, there was literally nobody there. Usually there would be 30 boats, so if you are looking for some chinook closer to home try the Bell or T-10 this week. Just seems everyone is offshore chasing sockeye. There isn’t too much better than a Father and Daughter fishing trip with some sockeye in the morning and a couple of nice chinook from Sandheads in the afternoon. Coho: You forgot about them didn’t you? Well they are still here, stacked up off West Van. We have had some awesome coho fishing this week, with multiple double headers. 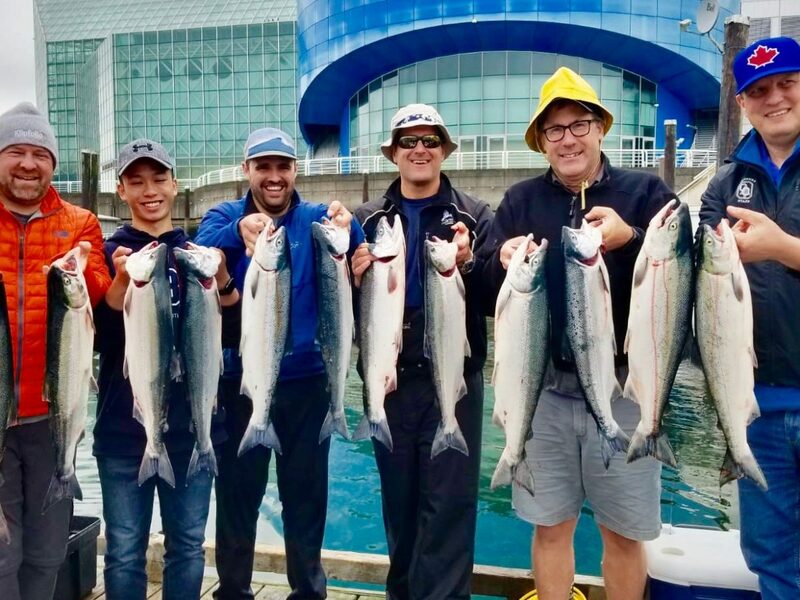 There were are few days the sockeye fishing was tough and our guides took off to West Van to coho fish and it paid off big time with limits of coho for their guests. Lots and lots of hatchery coho around, so looks like it is going to be a good return. The Cap is ultra low, so the good fishing should continue until we get a big rain and the fish can get up the river. White hootchies, Irish Cream 3.5 spoons, and 5.5 anchovies have all been working well. We had a great time this year working in the weigh boats! It was a bit rough out there but we made the best of it. The top 3 fish were in the 20-24 pound class. The event was a huge success and sold out early this year. We are already looking forward to next year. If you want to see some great pictures, check out Vancouver Chinook Classic on Instagram. A big thank you to all our sponsors, weigh boat volunteers, and all our participants. See you next year!